Clackamas' Elly Bankofier stepped up when the Cavaliers needed her the most against Jesuit on Friday night. Bankofier scored seven of her game-high 13 points in the fourth quarter, including the go-ahead basket with 2:47 to play, lifting the Cavaliers to a 37-32 victory over the Crusaders in the second round of the OSAA Class 6A girls' basketball playoffs. 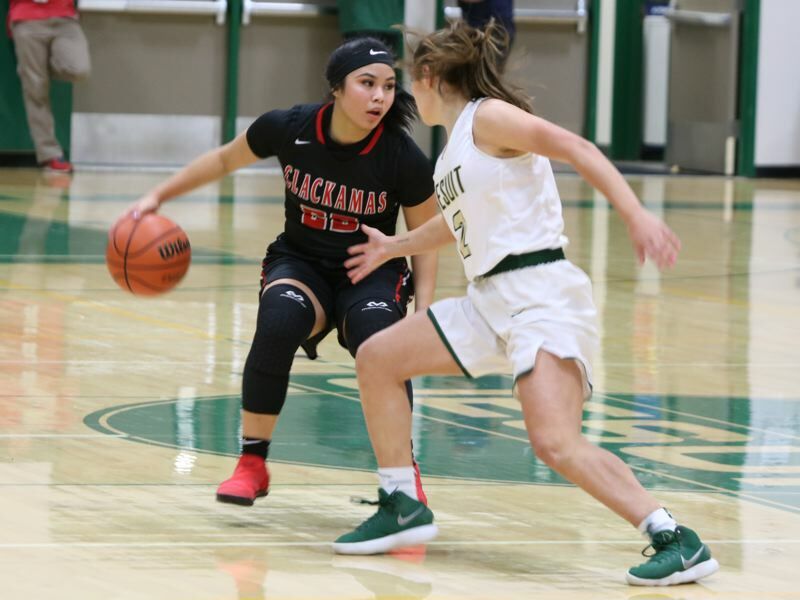 Bri Phiakhamngon added 10 points and Clackamas put the game away by knocking down 10 of 12 free throws in the final 2:18, sending the Cavaliers (23-3) into Wednesday's 1:30 p.m. quarterfinal against defending state champion Southridge at the Chiles Center. "We're ready," Cavaliers coach Korey Landolt said. "It's fun to have these challenges and see how your team reacts. "Moving forward, I know we have Southridge. We've seen them once this year and it didn't work out very well for us, but we've had to redefine ourselves and I feel like we've got a different spark that we haven't had for awhile and I'm excited about that." Jesuit's Amyr Lowe scored a team-high 12 points off the bench as the Crusaders finished the season with a 19-7 record. There were six lead changes and two ties in a game that in large part boiled down to what happened at the free-throw line where Clackamas went 17 for 23 to Jesuit's 6 for 18. "Congrats to Clackamas," Jesuit coach Jason Lowery said. "They made a few bigger plays down the stretch than we did. "I thought we fought hard. We talk about playing hard and playing together. We did that. I just don't think we played well enough offensively." The game unfolded as a defensive chess match that was a virtual toss-up during a first half that ended in a 15-15 tie. At one end of the court, Clackamas came out in a 2-3 zone and rarely broke formation. The plan was to keep Jesuit from getting to the basket while inviting the Crusaders to take their chances from the outside. "We watched some film and Jesuit just has a way of getting to the hole," Landolt said. "The only thing we knew that we had in our back pocket that might stop them was trying to contain their dribble drive with a 2-3 zone and clogging up the middle a little bit. "They made us work on defense. I mean, they had some pretty long possessions throughout the game and my team did a really good job of continuing to communicate and rotate, and communicate and rotate." At the other end, Jesuit used a concerted to stop Clackamas' two primary bigs -- 6-2 Ciara James and 5-11 Kalani Hayes -- from getting established inside. The Crusaders used Jordyn Turner to lock up James, while Bella Mori and Kailynn Tuck took turns hounding Hayes, the Mt. Hood Conference Player of the Year., whether she had the ball or not. That part of Jesuit's game plan worked, too. Hayes finished with five points. James had one. "If you had told me that we'd hold Hayes to five points and James wouldn't score, I'd say, 'C'mon, let's go,'" Lowery said. "But Clackamas had some other people who really stepped up." Bankofier, the Cavaliers' 5-9 senior guard, jumped up and stung Jesuit at several key moments, including two free throws at the end of the second quarter that tied the score 15-15 going to the break. With the score knotted at 25-all in the fourth quarter, Jesuit's Anna Fanelli came away empty on a drive to the basket, Hayes grabbed the round for Clackamas and made a sharp outlet pass to Bankofier streaking down the court for a transition basket that put the Cavaliers in front 27-25 with 2:47 left. "Jesuit was really good inside defending our bigs, so I had to have the ball in my hands more that game," Bankofier said. "That's not normal, but I felt like I had to step it up. I'm a senior, this was going to be last game if we lost, and I just knew what I had to do." Next, it was Clackamas' Olivia Morris, another senior, who grabbed the spotlight as she hit two free throws and then stole the ball, got fouled and hit two more free throws that pushed the lead to 31-25 with 1:50 remaining. "All that was going through my head was that the game was 0-0 and we had to do what we could to get the lead," Morris said. "I knew I had to hit those free throws because they were really important. "We definitely have been focusing on putting each other on our backs. When one person can't carry the team, then we've got to carry them with us. We really came through tonight." After Jesuit's Elsa Hookland scored on a drive to the basket to cut Clackamas' lead to 31-27 with 1:37 to play, Bankofier scored the Cavs' next five points on free throws to help put the game out of reach. "It feels great," Bankofier said. "I'm so excited that was not my last game. I'm ready to do big things." It doesn't get much bigger than Wednesday's quarterfinal match-up with top-ranked Southridge. The Cavaliers lost 59-26 to the Skyhawks of Beaverton in the semifinals of the Nike Interstate Shootout in late December, but are eager for a rematch with the Metro League champions. "Yeah, we know what's next," Hayes said. "We've been preparing all year to get another chance at them." Said Landolt: "I'll take my team into any fight, for sure." If the Crusaders had Friday's game to do over again, they said there wasn't much they would have done differently other than make a few more shots. "Honestly, I just think that it was an offensive thing," said Turner, the Crusaders' junior post. "Our defense is the one thing that I think never fails us, but offensively we struggled to score a little bit." What was it about Clackamas' 2-3 zone that gave Jesuit so much trouble? "They were really long, so it was hard to get the ball past some of their defenders," said Fanelli, the Crusaders' junior point guard. "Jordyn had a good presence inside, but Clackamas was really tough on defense. They were everywhere and closed out on our shooters really well, so it was hard to find the basket. "I think we gave it our all. It just came down to finishing shots and making free throws, and at the end of the day Clackamas finished it out better than we did. It was a good win for them." Lowery had no complaints with the shots his players were getting, just that not enough of them found the mark. "I just told my players, our feet were in the right place, we were making the right plays, but sometimes it literally comes down to making shots," he said. "I thought we got the looks that we wanted. We depend so much on our pressure, but it's hard to get into our pressure when we're not scoring." Lowe, the 5-5 senior guard, played her final game for Jesuit, but everyone else on the Crusaders' roster is eligible to return next season. "I like our group," Lowery said. "We'll all be back, we'll get better, and hopefully we'll have a better result this time next year." Clackamas (37) -- Elly Bankofier 13, Phiakhamngon 10, Hayes 5, Duarte 4, Morris 4, James 1, Mongelli, Huynh. Jesuit (32) -- Amyr Lowe 12, Mori 6, Freeman 5, Hookland 4, Corradini 3, Harrington 2, Fanelli, Turner, Tuck, Comia, Hickey.